Check out our collection of You Are Here Cartoons! Over the years, James Ciarrocca, GIS Specialist of Dickinson College, has been collected “you are here” themed cartoons from local papers. These original clippings have been digitized for your personal enjoyment. Want to know more about the collection? Contact us! These cartoons are being used for a nonprofit educational purpose and are in no way meant to affect the potential market of the cartoonists. The nature of this collection is to reflect on humans’ spatial literacy or in this case illiteracy. Enjoy! Visual impact analysis of proposed building in downtown Philadelphia using CityEngine. First, the disclaimer. Any numbered list is inherently subjective. So there are bound to be resources that you might know about that I haven’t included here, primarily because I haven’t heard about them (yet). This list was curated based primarily on whether the site, portal or database in question expands conventional wisdom about how technology can be used to address climate change or sustainable business practices. Several (such as FreshRealm, GridWaste and MySolarCity) represent intriguing twists on how the Internet can help reinvent business models or improve customer engagement. If you want to consider a broader selection of Web and mobile resources that have been available for a longer time, here are two of my previous lists (still relevant). Rather than updating information in those past stories, this latest list offers 10 additional resources or platforms worth watching during the next 12 months. Although Esri (aka the Environmental Systems Research Institute) has been around for more than 30 years, its online geospatial resources have sparked a veritable “app revolution” over the past several years among urban planners and sustainable business innovators. The latest version of the CityEngine platform (released in October) is used in combination with the company’s ArcGIS mapping resource. Its main purpose is to convert two-dimensional diagrams into three-dimensional models that show details such as how a new building could affect solar exposure or whether it will create heat corridors. The platform helps businesses and communities research the impact that natural habitats such as oyster beds, coral reefs, tidal marshes, dunes or mangroves have on flooding and erosion. The information is intended for risk assessments and could be used by developers or municipal agencies. It was developed through a partnership of the Nature Conservancy, the Natural Capital Project, the Center for Integrated Spatial Research, the University of Southern Mississippi and the U.S. Geological Survey. Two years in the making, this cloud-hosted traffic analytics service was launched in mid-2014 by software developer Citilabs. (Its previous applications are tied to the desktop.) The platform provides information about traffic volume and can be used to calculate and model energy consumption and pollution metrics related to various urban transportation services. Sample applications include predicting future flows based on proposed development. The U.S. government’s mandate to “open” valuable climate and atmospheric information for use by “citizen scientists” has inspired the creation of rich online resources that can be used as the foundation for apps and services. One specific example: fresh maps on global carbon dioxide concentrations, collected by NASA’s Orbiting Carbon Observatory-2 and released on an ongoing basis. In early December, Esri teamed with the U.S. Geological Survey to publish what is described as “the most detailed global ecological land units map in the world.” The platform, dubbed EcoTapestry for short, contains a wealth of ecosystem data about soil, streamflow, biodiversity and land cover. It is intended for land management applications and planning exercises. This commerce startup created by fresh produce company Calavo Growers received $10 million in new funding during 2014 to prepare for its pending commercial launch. Its vision is to facilitate national delivery of fresh foods, through its online ordering service. Integral to its plan is the “Vessel,” its special chilled container. It will use FedEx and local carriers to facilitate deliveries. Developed by the World Resources Institute with partners Google and the Jane Goodall Institute, this resource (still being beta-tested) makes use of satellite imagery to provide a near real-time update of deforestation. The idea is to keep much closer tabs on clearing, so that steps can be taken much more quickly to prevent illegal activity. The idea behind this online marketplace is simple: help businesses find more efficient or sustainable trash hauling options. It considers information such as route density, recycling rates, container use and truck optimization — basically providing more transparency about various haulers through its Waste Data Project. Some of Grid Waste’s initial commercial customers include Hyatt, Lockheed Martin and the Ritz-Carlton. Yes, other applications and websites let utilities offer home energy management and analysis services for residential customers. What makes SolarCity’s app unique are engagement features that track the location of installation and repair technicians or that monitor the production of panels once they are in place. MySolarCity also provides a map showing nearby projects, and lets customers become “ambassadors” who can earn fees for referring new accounts. This modeling tool from Ecolab and Trucost allows businesses to run assessments that consider potential exposure or negative impacts that scarcity could pose to facilities. It uses information about water consumption, as well as projected use three years into the future. Then, it assigns a grade for different locations. The idea is to help sustainability and operations managers prioritize conservation projects or management measures. Understanding how to think about problems and concepts in a spatial context is a fundamental skill that is not well taught in the current Dickinson College curriculum. Alternatively referred to as “Spatial Literacy” or “Spatial Reasoning”, this type of thinking generally focuses on understanding the importance of geographic space and the relationships formed by this space. Spatial literacy, like writing and quantitative analysis, is not a stand-alone subject, but rather it is a way of thinking that is applicable to many fields of studies, and is becoming increasingly important as a valuable competency for liberal arts students throughout all divisions. This course will examine the importance of geographic space as a learning construct and explore the value of spatial literacy for problem solving, creative expression, and communication across the humanities, social science and scientific disciplines. In doing so, students will have the opportunity to consider topics within their specific areas of study, and to discover how the application of spatial thinking can enable and facilitate the problem solving process across the curriculum. Students will be introduced to an assortment of easy-to-use mapping tools that include both quantitative and qualitative techniques, and will learn how to use these tools to investigate issues and questions from a spatial perspective, incorporate spatial analysis techniques into their problem solving methodologies, and to effectively visualize their data in ways that promote a more comprehensive understanding of the problem statement. Geographic Information Systems (GIS) is a powerful technology for managing, analyzing, and visualizing spatial data and geographically-referenced information. It is used in a wide variety of fields including archaeology, agriculture, business, defense and intelligence, education, government, health care, natural resource management, public safety, transportation, and utility management. This course provides a fundamental foundation of theoretical and applied skills in GIS technology that will enable students to investigate and make reasoned decisions regarding spatial issues. Utilizing GIS software applications from Environmental Systems Research Institute (ESRI), students work on a progression of tasks and assignments focused on GIS data collection, manipulation, analysis, output, and presentation. The course will culminate in a final, independent project in which the students design and prepare a GIS analysis application of their own choosing. Three hours classroom and three hours of laboratory per week. This course is cross-listed as ENST 218 and ERSC 218. This course fulfills the QR distribution requirement. Photo by Carl Socolow ’77. 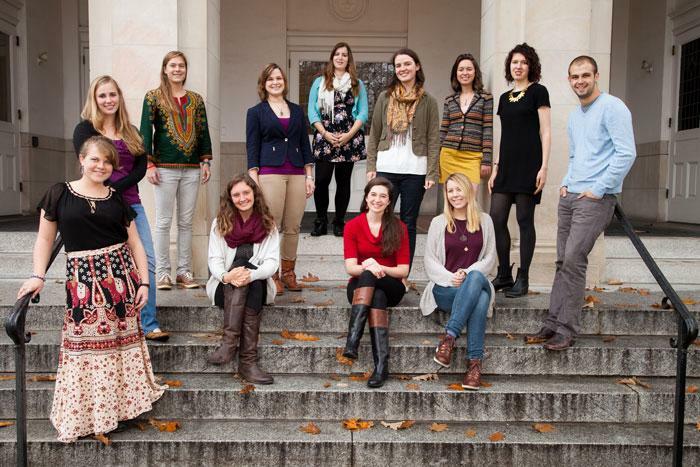 Now in its third year, the Baird Sustainability Fellows program recognizes Dickinson seniors who have advanced sustainability goals through their scholarship, leadership and service efforts. Named for Spencer Fullerton Baird, a prominent 19th-century naturalist and Dickinson alumnus, the program this year brings together 12 students for collaborative projects and research to help create a sustainable world. Read about Chloe and Tabea’s missions below. Chloé Miller is double majoring in archaeology and anthropology. Sustainability not only plays an important role in her academic fields, but also in her personal life. Raised in a Catholic and Native American household, she believes it is her responsibility to help return balance to the Earth for the sake of future generations. Chloé’s unique upbringing has guided her academic pursuits to understanding the dynamic, synergetic relationship between anthropogenic forces, human biology, and the natural landscape. Her interests have taken her all over the world, from the Altiplano of Bolivia to Transylvania, Romania. While in Bolivia with Dr. Maria Bruno and Dr. Christine Hastorf, Chloé saw how past human interactions with the environment have evolved into the agricultural practices of contemporary highland farmers. She also observed how Bolivian politics, social inequalities, and the high global demand for quinoa is negatively impacting these farming groups. In Transylvania, Romania, she participated in a communal archaeology project that involved collecting information about medieval churches once forgotten by the Székely people, a long-existing Hungarian ethnic minority. Seeing this loss, which was the product of socioeconomic and political forces, first hand has inspired her to apply for a Fulbright Research Grant. She plans to return and provide support through complementary research about the historical relationship between pre- and post- Christian traditions among the Székely by using bioarchaeology and mortuary analysis. On campus, Chloé works as a GIS intern where she helps Facilities map and analyze different aspects of the Dickinson campus and sustainability projects. She also helps the Classics Department cultivate a sense of cultural sustainability by spreading awareness of classical Greco-Roman culture as the Classics House Manager and as a Latin Club Teacher. 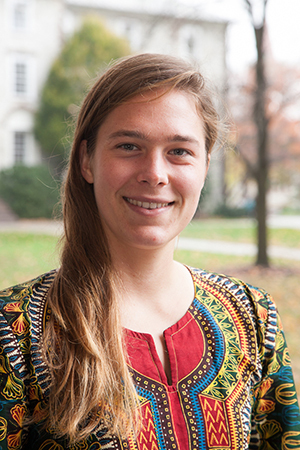 Chloé believes that a biocultural approach to understanding the human condition is a unique and understated aspect of sustainability, so she is excited to bring this to the colloquium. She hopes to represent a different perspective of sustainability that recognizes the need to not only understand how humans are affecting the environment but also how we our affecting ourselves. 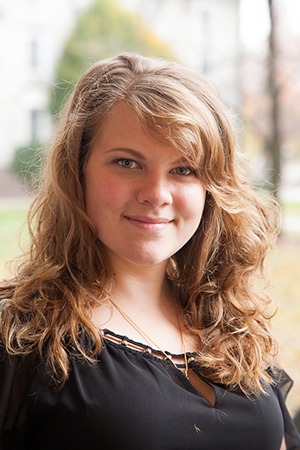 Tabea Zimmermann is an Environmental Science major with a minor in French. In her time at Dickinson, Tabea has participated in many opportunities that have shaped her view of the natural environment and how humans use and value it. Her work at the college farm and with the Alliance for Aquatic Resource Monitoring (ALLARM) served as foundations for two different study abroad experiences. Last year, Tabea spent a science-intensive semester in Cape Cod, MA studying the biogeochemistry of aquatic and terrestrial ecosystems with the Marine Biological Laboratory. In the spring, she replaced her lab coat and safety glasses with sandals and a camera as she explored the culture and society of Cameroon. Here it became apparent that sustainability is just as much a factor of a people’s history, economy, and culture and it is about the natural environment surrounding it. At Dickinson, Tabea is studying how different lakes have responded to environmental stresses such as climate change and atmospheric deposition and which lakes will be most sensitive to future disturbances. When she’s not happily buried in science, Tabea enjoys running with the cross country team, tooting her oboe, and reconnecting with friends. She’s looking forward to collaborating with a diverse group of students and having time to reflect on her recent experiences while continuing to evolve her understanding of sustainability and what it means to be an engaged member of her local and world-wide communities. Interested in anything GIS? Then take the time to explore GISCafe.com, which delivers the latest GIS industry commentary, news, product reviews, articles, events and resources from a single, convenient point. It is a portal targeting GIS and geospatial professionals that supplies complete GIS product catalog listings, technical papers, GIS news, CEO interviews, multimedia presentations, priority press releases, event postings, job placement and more. Checkout features such as the GISWeekly Review, which delivers news concerning the latest developments in the GIS industry in a readable newsletter format. It is a great way to explore the GIS industry and its pertinence to daily life. Enjoy! Children’s Hospital Boston and Harvard’s HealthMap now includes ananimated Ebola cases/death map. The map taps official sources, but also social media. “The news reports and social media posts aren’t always reliable, but in general they provide an up-to-date sense of what’s happening,” said John Brownstein, co-founder of HealthMap and director of the Boston Children’s Hospital Informatics Program. Newsweek suggests the map identified the outbreak nine days before the WHO announced it. The website, which is run by a group of researchers, epidemiologists and software developers at Boston Children’s Hospital, noted a “mystery hemorrhagic fever” spreading in Guinea nine days before the WHO issued its first statement on the outbreak. Another one of those companies looking to provide global unique addresses (I summarized a few effortslast year) is tapping into the interest in tracking ebola to highlight its work. Addressing Homes LLC is an organization created by AIMTEC (Aerial Imagery Mapping Technology), a technology company that has been developing geospatial technology since 2004 for the purpose of developing a single global addressing system to serve all nations and regions, worldwide. AIMTEC is the creator of the AimObserver™ device that uses the companies Mobile Mapper technology to instantly provide a unique and accurate latitude and longitude “address” to any location on Earth, down to an area as small as 8.8 feet. The work is with the government of Liberia. It’s not clear that WHO is involved. Reddit is the source of so many maps (for better or worse). This week a Redditer (5thEye, post w/ comments) took Center for Disease Control data on where it recommends Americans avoid drinking tap water and related products (ice, ice tea, etc.) a map. 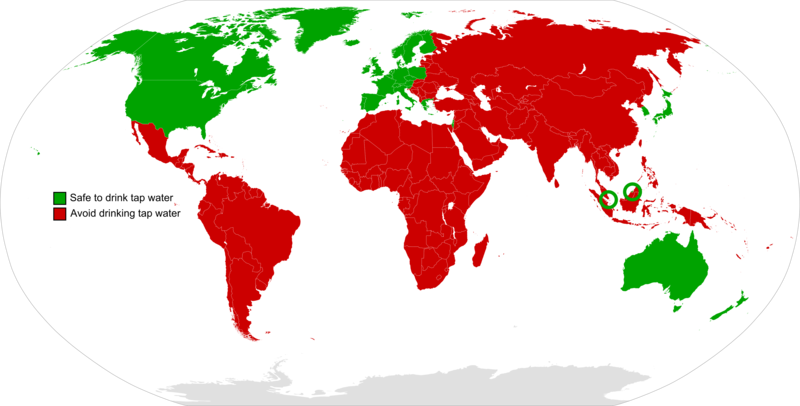 The map shows red and green areas, which should be self explanatory. I’m heading to Israel later this year; the water is fine, but there are other safety issues. Esri’s interactive Ebola Outbreaks story map enables users to explore the first known contact with the disease in 1976 in the Democratic Republic of Congo and every outbreak since then, including the ongoing crises in Guinea, Liberia, Sierra Leone, and Nigeria. Basic statistics about each outbreak and reports from different agencies are all directly available within the map. Localization: With the help of a newly created database and subsequently produced maps, the GIS officer was able to pinpoint the exact location of villages and identify villages that had the same name but were in different parts of the prefecture. Based on this information, MSF program staff were able to respond to the outbreak faster, in a more targeted way and with fewer resources. Visualization: A weekly mapping of confirmed and suspected Ebola cases helped translate the progression of the epidemic from technical data into an easy-to-grasp map. As a result, staff at all levels had a better understanding of the emergency. At the Wendy’s corporate headquarters in Dublin, Ohio, real estate director John Crouse is swimming in data about the company’s almost 6,000 fast-food restaurants nationwide. Crouse and one other colleague are responsible for building and analyzing maps of Wendy’s locations and the surrounding areas. They rely on a geography-based data program to quickly comb through large volumes of information — decades of sales records, demographic descriptions of nearby residents, and other data points — to predict how much a restaurant might take in annually at sites in the United States. Once Crouse researches a potential site, he submits it to an internal committee; if the location is approved, engineering and construction can proceed. 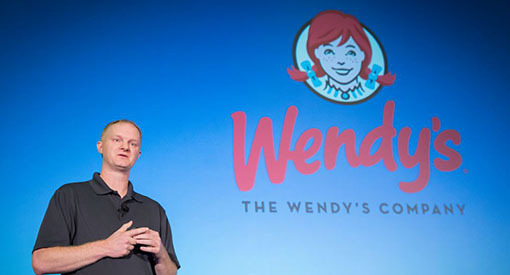 Wendy’s is one of the latest companies to make use of software from a Redlands, Calif., company called Esri. Esri specializes in mapping various kinds of data — much of it culled from publicly available data sets — to help people visualize relationships, patterns and trends. Especially since the economic downturn in 2008, many large corporations have been looking to such software — known as “geographic information systems” — to better direct their limited real estate budgets, according to Wayne Gearey, senior vice president for location intelligence at commercial real estate firm Jones Lang LaSalle. “It’s just starting to become industry standard for [corporate] real estate decisions,” said Gearey, who uses Esri and other mapping services, such as MapInfo’s and Google’s, for his clients. Mapping software has saved Wendy’s about $750,000 over the past two years that the company said it would have spent on various analytical and market research services. For instance, Esri’s maps pull Census data to shade neighborhoods based on their average income. This helps Wendy’s determine where customers and employees are likely to be. “We look where more income is, or less income, and where areas are more concentrated with family households, rather than empty nesters,” Crouse said, though he noted that this is just one element of the decision-making process. The Wendy’s human resources department is using mapping data to learn about wage requirements and available workers, he said. “If you’re in a more affluent area, it’s going to be a little tougher to find” employees, Crouse said. Even after the location is built, the company is beginning to use demographic data to adjust operations to the local customers, he said. In relatively high-income areas, industry data suggests that affluent customers “tend to spend more per transaction, in some cases, but they may not come as often,” Crouse said. At some franchise-owned restaurants, for example, owners come up with their own hospitality tactics — such as having staff walking around the restaurants to engage customers, perhaps offering to get them water or help in some other way. While “those are things that are really hard to quantify,” linking them to consumer satisfaction could help the company share best practices with franchise owners across the United States. Stay tune for more news about our students as they learn the trade! Army Geospatial Center Director Joseph Fontanella is responsible for providing geospatial expertise across multiple customer communities and technical disciplines ranging from operations, intelligence and acquisition to research and development, and modeling and simulation. The center he oversees does this by providing topographic, geodetic and geospatial information to the Army and the larger Department of Defense. The center employs both forward-deployed and reach-back elements. As the Army’s Geospatial Information Officer, Fontanella is responsible for collecting and validating geospatial requirements, formulating policy, setting priorities and securing resources in the support of the Army Geospatial Enterprise. C4ISRNET: What is the mission of the Army Geospatial Center [AGC]? Fontanella: Our job is to provide timely, accurate [geospatial intelligence] products and services within the framework of functional areas that support the Army Geospatial Enterprise: warfighter support, systems acquisition and program management, enterprise development and acquisition support. We also provide support in ways the national agency can’t, and we have our own collection capability. We’re a source of geospatial expertise to the Defense Department, FBI and others. We also set standards and enforce compliance, but the overriding goal is to enhance the ability of the commander to map his or her battle space. C4ISRNET: How close are we to a common operating environment? Fontanella: We’re coordinating with NGA [National Geospatial-Intelligence Agency] and supporting studies that optimize technology investments as they relate to common overlays, formats and ways of depicting 3-D data. We’re trying to build a ground war fighter geospatial data model. The endgame is to ensure that soldiers have the most timely and reliable information that we can bring to them, in a format that’s useful to them. If you look at how GIS [geographic information systems] technology has become more user-friendly over the years — we can take some of the credit for that because we have some ability to shape industry behavior. We’ve been pushing for open standards, and for the elimination of stovepiped systems with proprietary formats. The goal, of course, is to become platform agnostic systemwide. C4ISRNET: Describe changes in the way geospatial data is accessed. Fontanella: The challenge has always been how do you move bulk data into devices with limited capacity, and what we’re seeing is a shift from stand-alone applications to more open access to Web services. The goal is something that already exists on the civil side, like using an Android or an iPhone to navigate to a retail store. The data is pulled into the phone through an application that lives there, but the bulk of the data resides in the cloud. Ultimately the application and the data will have to reside on the device. C4ISRNET: Tell us about AGC’s work in the discipline of human geography. Fontanella: [Our] research and development is focused on human social and cultural dynamics, and how they influence what’s going to happen in a given area. In Afghanistan, we’re looking at models for predictive analysis, and in many cases the map tells a story that clarifies what’s going on in a specific area when you monitor activities in places over time. We are seeing an explosion of data. Operational graphics, map-layer data, feature data, thematic data. The challenge is standardizing on common formats and data standards. C4ISRNET: Describe recent mapping initiatives in Afghanistan and Iraq. Fontanella: The Army has discovered that in a counterinsurgency environment in built-up areas, the standard 1:50,000 map scale is inefficient for combat operations. So we went to Afghanistan and Iraq and collected high-resolution, 3-D data to produce geospatial products with an accuracy of one meter. This was at a time when NGA was working in the 30-meter range. We mapped roughly two-thirds of Afghanistan and most of the built-up areas and [main supply roads] in Iraq. High-res 3-D LIDAR [light detection and ranging] data is absolutely essential to urban operations. There’s a worldwide need for this type of data that’s not being met. If you want to build nations and bring services to people, or build any kind of representative democracy, you have to know where and how people live. It all begins with a map.